Yeah. Once Dellenger reported it, it was a 90000% DONE DEAL. He probably tweeted it from the plane or Les’s house lol. Les Miles. To KU. 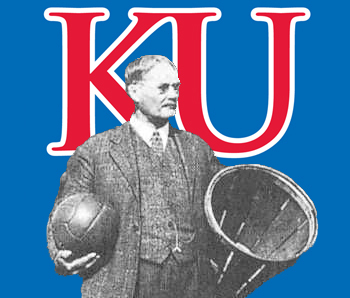 To KU. Excuse me, I’m going to have to take a moment to let thought unwrap in my brain. I say he makes 4 bowl games in 5 years, and then wants to go back to LSU, where he gets fired after his 3rd game. LOL. He can never go back to LSU. @BShark You’re overestimating both parties intelligence. If he starts winning at KU, and LSU starts losing, all bets are off. Those Cajuns are bugshit crazy about their football. 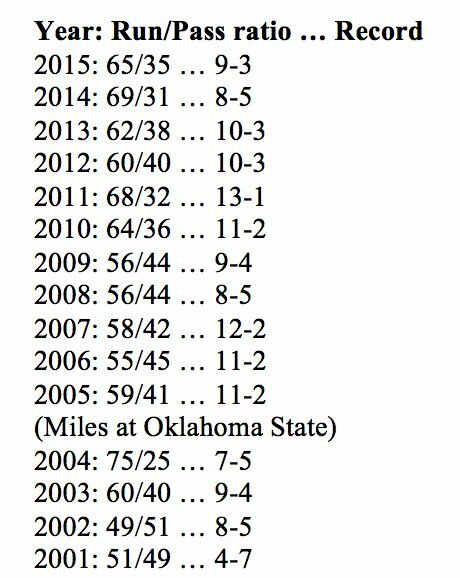 Les had the best record in the SEC from 2005-2015, won a national championship, and several big time years. And they fired him for going 2-2. Those fans would hire Charles Manson if they thought he could win them football games, and their utter guile would compel them to come back after Les, with no sense of irony. It’s a lethal combination of Bugtussle, Friday Night Lights, Big Oil and Gas money, and shrimp ettouffee. Keep in mind, he has to recruit to Kansas, typically very difficult. He needs to keep Pooka. I’m going to give it the old “wait and see”. I’m very interested to see what they can put together this year in recruiting. Might surprise some. KU/BMDs are sinking a LOT of money into football. Miles is on a plane to Lawrence today. He needs to be on a plane to recruit tomorrow. They’re going to go from 0-60 in 4 seconds. They’ll hire a bushel of talent, and we’ll see recruiting like we’ve never seen. They’ll be playing for championships in 4 years. He flew into Topeka already. YES!!! #1 job today is talk to Pooka and go sign some offensive and defensive lineman. 2.775M annual salary. Very surprised by that. 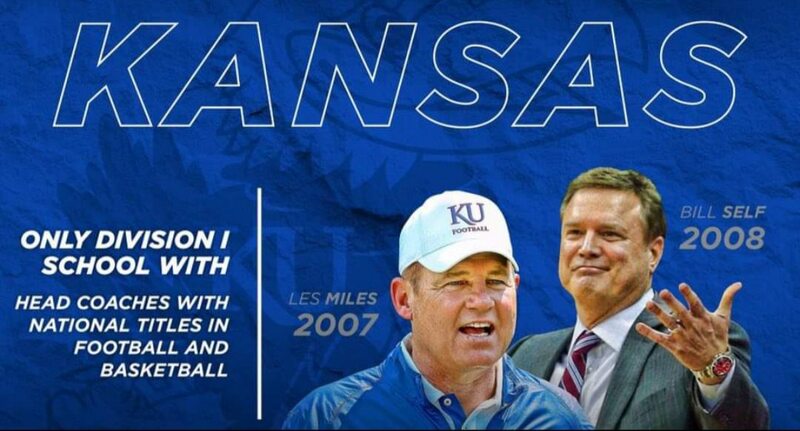 That’s a great deal for KU. Makes me think the assistant pool will be greatly increased. Pooka Williams Heisman Trophy winner in 2020!! The OC will be a huge name and will also be HCIW. Anyone driving down I-70 today be careful, a ton of mild cats just shat their pants. So he agreed to a 2,775,000 5 year contract - - -will be introduced at 5 on a special hawk talk so will be able to hear right? - -lots of incentives for him - -has additional retention bonuses on November in 2020 - -And 2022. Contract was signed Friday apparently. I think you all are going to be very, very happy with the assistants. @cragarhawk lmao we will see. I hope we don’t run a pro style offense because I think the air raid is fun to watch. But we do have a solid stable of RBs and I wont care if we are winning. I how we don’t run a pro style offense because I think the air raid is fun to watch. But we do have a solid stable of RBs and I wont care if we are winning. OC will handle the offense mostly and I believe it will be a scheme best suited to the personnel. @BShark It never mattered who the OC at LSU was, it was Les Miles system and that was a pro style run first system. Someone knows how to win. Did you hear what he said about minimizing possessions when you are at a talent disadvantage? "I can tell you, when we had Mettenberger, we threw for 3,300 yards and had two 1,000-yard receivers. When we had passers, we threw it. When we had players who couldn’t throw well, we ran the football and won 10 a year. @BShark Hmmm. Imagine that. My kind of coach. @BShark Hugh Freeze as off coordinator - we’ll have the whole Dixie Mafia on board before you can say “Pooka to the left …Pooka to the right …”. No doubt Freeze would be a remarkable play caller- is he going to be our recruiting coordinator? Not sure that would end well. We could full monte on it, turn overnite into a football machine, have a Top 5 recruiting class, then take our ncaa penalties, lay low for a year or two, and then gear it up back again. Well what did you think? -kind of struggles , but people saying he is not really a good interview. - Sid some things I like what I heard. - -Biggest thing I like I think is that he is very open to talking to the current staff about the possibility if being retained. - -say like Oh I dunno maybe Tony Hull possibly lol - really hope that work out. Read a lot of comments from former LSU fans or other people saying he is a great recruiter. - -said starts with finding the OC - -and Dc first with his staff, -will be hitting the phone tomorrow making contact with possible asst’s. - -ring was nice & that was a conference ring - would love to see the National Championship ring. Seen his name mentioned during the presser - ok so I have no idea where is this guy from? The only reason Freeze got outed is because he beat Bama too much. @jayballer73 Freeze was head coach at Miss when they went to the Top 5 in rankings and recruiting, and then got hammered by the NCAA for recruiting violations. Freeze was let go. He did have a big year or two, until he got caught. @BShark It wouldn’t surprise me if Alabama turned them in.